The NFL is obsessed with present performance, but the truly great players couple production with longevity. Taking the field every week is not easy in a sport as physical as football. The most consistent players are able to play through the pain barrier, and are also lucky enough to avoid major injuries. Consistency also requires a minimum standard of performance. The best players can be counted on for at least a solid outing every week. With these qualifiers in mind, here is a list of the most consistently-productive players over the last five years. Joe Thomas’ cumulative +312.4 grade over the past nine years may never be matched by another tackle. He has missed just one snap in that span. Thomas is the best pass-protecting tackle currently plying his trade in the NFL, ranking in the top 10 in pass-blocking efficiency in each of his nine pro seasons. He has not ranked outside the top five in that metric since 2008. In the past five seasons, he has only graded negatively in pass protection on seven occasions, finishing with 22 perfect games out of 80. Thomas has never been the most dominant run-blocker, but he is still mightily effective, currently holding a +113.9 cumulative career grade. Team success has eluded the league’s best tackle, but that shouldn’t diminish his personal accolades. Watt’s dominance has been well-documented, but his career to this point deserves some context. Despite playing on the interior, Watt’s numbers leave him streets ahead of the NFL’s best pass-rushers over the past five years. In total, he has 85 sacks, 151 hits, and 195 pressures to go with 44 batted passes. Watt has disrupted one out of every seven passing snaps he has been on the field for to this point in his career; discount his rookie season, and that jumps to once in every five passing snaps. Since 2012, Watt has recorded only six negatively-graded games. Larry Fitzgerald is one of the NFL’s iron-men, playing at least 90 percent of snaps in each season since 2007. Only in 2012 did Fitzgerald’s performance leave a little to be desired. Overall, though, in a five-year span, he has caught 34 touchdowns from 420 receptions for 5,400 yards, dropped just 15 passes, and broken 53 tackles. He graded negatively in only two games last season, helping Arizona to the NFC Championship game. 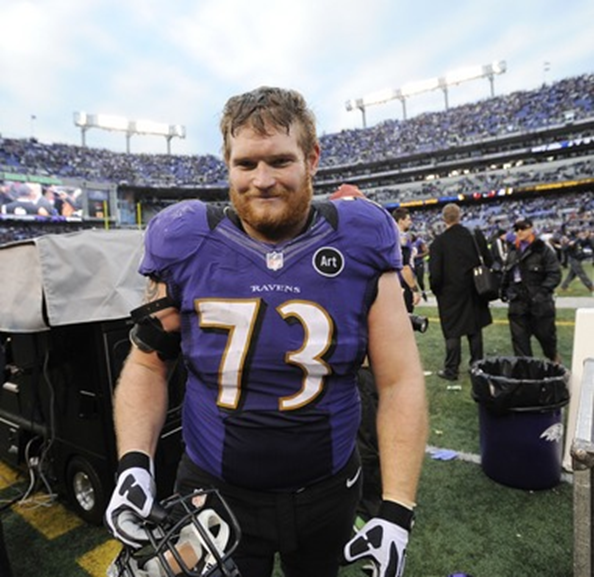 Another NFL entrant in 2007, Marshal Yanda has quietly dominated the pro game for the past nine seasons. Yanda’s cumulative +300.2 career grade makes him our most-consistent guard. Although never blessed with outstanding athleticism, he forged an All-Pro career through hard work and physicality. He has been a top-five run-blocking guard in every season aside from 2012 (when he finished 15th), bullying defensive lineman in the Ravens’ zone scheme. Although not his strength, Yanda can hold his own in pass protection. He has given up only nine sacks, 15 hits, and 60 hurries over the past two seasons. Kelechi Osemele recently got the big payday from Oakland, but Baltimore was wise to invest in their right guard instead. A shoulder injury looked like it might prematurely end Brees’ career at one point. The Chargers moved on from him in favor of Philip Rivers, forcing him to take his talents elsewhere. The Saints have been rewarded for their gamble, however, with one of the best quarterbacks of the current generation. Brees’ has a +329.4 cumulative grade since joining New Orleans, including an incredible +75.9 grade in 2011. Over the past nine years, he has thrown for 46,772 yards, completed 67.8 percent of his passes, and notched 341 touchdowns. He has a QB rating of 99.5 in that span. Brees has not graded outside the top 10 at his position since PFF began grading games (2007). At 37 years old, the legend is showing no signs of decline. Despite often appearing hurt, Ware rarely allows injuries to keep him off the field. He remains a dominant pass-rusher, complementing Von Miller perfectly on the Broncos’ Super Bowl-winning defense. Ware has an astonishing 243 knockdowns (sacks and hits) in nine seasons, proving his longevity over the past decade. Over the past half-decade, he has 62 sacks, 58 hits, and 180 hurries. That stat line is a good career for most players. Consistency has eluded Ware against the run, but that negative pales in comparison to the terror he’s inflicted upon opposing quarterbacks. Sherman will likely go down as one of the biggest draft steals in NFL history. The fifth-round pick adjusted to the NFL immediately, recording the 10th-highest coverage grade amongst corners as a rookie. He has only improved from there, recording a +90.9 cumulative grade in his five NFL seasons. Sherman has allowed a career NFL passer rating of only 46.5, a completion percentage of only 47.0, picked off 28 passes, and added a further 50 pass deflections. He has only recorded a negative grade in 13 outings since his rookie year, finishing with nine straight positive game grades to end 2015. At just 28, Sherman has plenty of good seasons left in him. Weddle enjoyed an outstanding career in San Diego before signing with the Ravens this offseason. There are some indications that he might be on the decline after recording his lowest season grade since 2008, but a new environment could lead to a resurgence. Aside from 2015, where he ranked a perfectly-respectable 12th among NFL safeties in terms of overall grade, Weddle has not finished outside our top five at the position. Regardless of a potential decline, he has been the league’s most consistent safety over the past five seasons. In that span, Weddle has allowed only five touchdowns, picked off 13 passes, and deflected another 17. Weddle has given up an average QB rating of only 70.0 since 2011. Reliability is essential at the safety position—where mistakes can be crippling—making his consistency all the more impressive. We’re not convinced one of the NFL’s best safeties is finished quite yet.